As communications and cloud service providers continue to work toward network virtualization, they often seek advice and solutions that help accelerate adoption and reach their business goals. That help, from Intel and its ecosystem partners, extends to challenges faced by service providers’ enterprise and business customers. These end users encounter connectivity issues when using current consumer-graded IT appliances for business purposes. This issue has persisted even with the transition from traditional stand-alone appliances (such as load balancers, edge routers, firewalls, and VPNs) to virtualized appliances, where these functions run on general-purpose servers. Users still need sufficient physical connection ports (network connector count). The lack of network connector count and the interface/media compatibility between IT server and embedded system can be a challenge. It is, in fact, the most common problem that NEXCOM sees when implementing vCPE/uCPE (virtual/universal customer premises equipment). The huge volume of computing and network throughput needed for next generation networks creates new challenges. Intel introduced Intel Select Solutions for uCPE to provide a sound foundation for the development of uCPE products, and accelerate their qualification and deployment. Intel Select Solution use a reference design based on the innovative Intel® Xeon® processor D-2100 and other leading Intel® technologies. Intel then verifies the design meets a minimum level of features and performance. With these verified products, end users can realize a faster and more efficient deployment path of tested, reliable infrastructure with verified configurations. NEXCOM is excited to announce their commitment to work with Intel and test one of our own network appliances so it will be a verified Intel Select Solution for uCPE, the TCA 5170. The TCA 5170 supports Intel Xeon processors up to 18-cores and a maximum of 512 GB memory size capacity. It is able to support virtual machines (VMs) or a virtual network functions (VNF) in place of single-function machines. 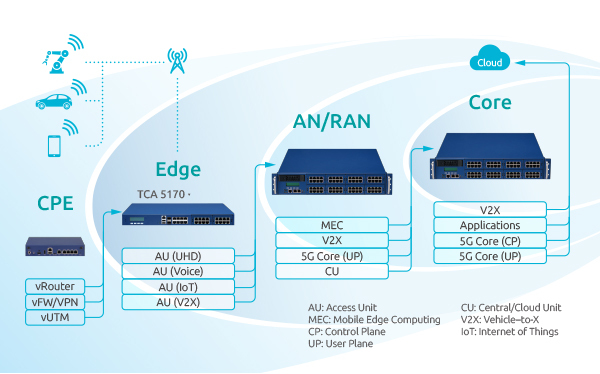 The great connectivity and expandable network interfaces provided by TCA 5170 offer a wide range of flexibility to adapt to different end user requirements, be it 25G/40G/100G connection speed, fiber type LAN bypass, or other end user needs. Connectivity: TCA 5170 is equipped with 4 SFP+ and 8 GbE ports (RJ45 type, with 2 pairs LAN bypass) for the uCPE/vCPE basic demand. When users need more connectivity, “TCA5170” provides additional 2 LAN module slots. Users can add 16 GbE port counts or up to 100GbE link speed by adopting NEXCOM standard off-the-shelf LAN modules. Each LAN port supports SR-IOV, no matter the network interfaces are built-in within the basic system or on the add-on LAN modules. Optimizations: TCA 5170 is optimized by using Intel® Virtualization Technology (Intel® VT) to enable virtualization for the uCPE/vCPE field. Scalability: TCA 5170 comes with high scalability as a server-graded uCPE/vCPE offering up-to 18 cores with Intel® Hyper-Threading Technology (2 threads/core) & 512 GB memory capability. Performance:: The Intel Xeon processors D-2100 at the core of the TCA 5170 support Intel® Advanced Vector Extensions 512 (Intel® AVX-512), Intel® Advanced Encryption Standard New Instructions (Intel® AES-NI), and Intel® QuickAssist Technology (Intel® QAT). The Intel® Xeon® D-2100 processor includes the Network Virtualization Offloads (VXLAN, NVGRE, GENEVE, NSH, etc.) to support the establishment and connection to the virtual network between VMs and group them as the LANs. Compatible virtualization: Virtual technology is not limited to equipment in the equipment room, and the connection between VMs and VMs is also a concern of Nexcom. As an enterprise-level of uCPE/vCPE, the TCA 5170 can support VM-to-VM connections from public or private Cloud, or from the uCPE/vCPE where the enterprise branch is located. How far away are you from the “edge”? With TCA 5170 the “edge” is under your feet. Visit us or contact us for more information.